Maxwell Supply is Oklahoma's leading supplier for flat work, tilt-up, paving and bridge accessories, site work fabrics (geogrids, geotextiles, and erosion control), waterproofig sealants, vapor barriers, and air shield. With products from the finest manufacturers, we supply heavy construction materials and light equipment including a wide variety of concrete accessories. We typically serve general contractors, concrete sub-contractors, pavers, bridge builders, dirt work contractors, and utility contractors working on paving projects, bridge and culvert construction, tilt-up and precast panel installation, as well as many other construction projects. 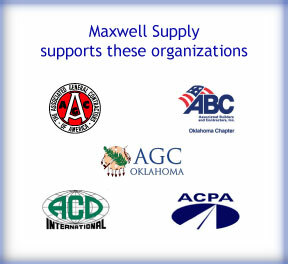 With stores located in central, southwest, and northeast Oklahoma, Maxwell Supply delivers anywhere in Oklahoma. When customers need a solution-minded sales and support team, they rely on Maxwell Supply to help them meet their scheduling and product needs. Maxwell Supply encourages all customers to be safety conscious.